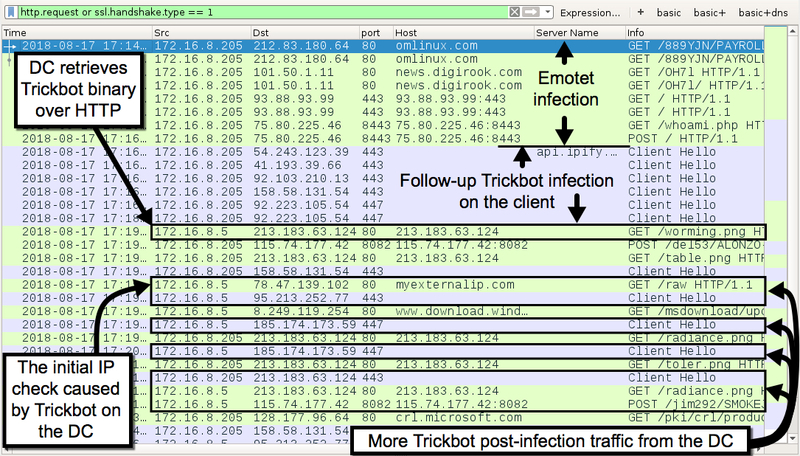 I saw the same Emotet + Trickbot combo that My Online Security (@dvk01uk) tweeted about this earlier today (link). In my case, the follow-up Trickbot spread from my infected client (Alonzo-PC on 172.16.8.205) to its domain controller (Smokejacks-DC on 172.16.8.5). Looks like Trickbot updated its method of propagation from the client to the DC--the first time I've seen this method used by Trickbot. Before, I would clearly see the Trickbot binary sent over SMB from the infected client to the DC. Check here for an example of the way Trickbot moved to the DC previously. Today, the infected client used traffic over TCP port 445 to cause the DC to retrieve a Trickbot binary over HTTP to infect itself with. I'm not sure of the exact nature of this new Trickbot propagation, but you can see it in the pcap as shown in the images section below. I've included Trickbot's "Modules" directory from my infected Windows client in today's malware archive, in case anyone wants to dig deeper. Shown above: No Trickbot EXE in the SMB traffic from client to DC like I've documented before. Shown above: No SMB traffic from the client to DC's C$ drive like I've documented before. 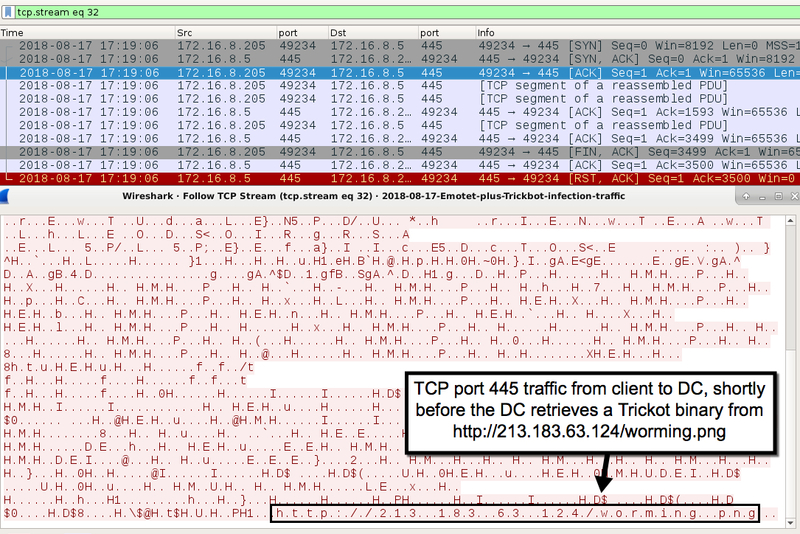 Shown above: Before the DC retrieves Trickbot from 213.183.63.124/worming.png, we see the URL in traffic over TCP port 445 from the infected client to the DC. Shown above: That TCP port 445 caused the DC to retrieve the Trickbot binary from 213.183.63.124/worming.png and infect itself with it. As I mentioned earlier, check here for an example of the way Trickbot moved to the DC previously.